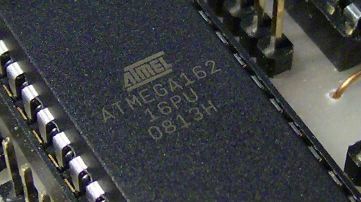 On this site you will find many projects, source codes and tools for Atmel AVR microcontrollers - one of most popullar MCU. Source code for reading iButton serial number and display it on LCD. Source code for ATtiny2313 AVR MCU for decoding remote control RC5 infrared signal. Driver library for 1-wire master implementation. Driver library for alphanumerical LCD with HD44780 controller. For 4-bit mode without read busy flag. Routines in assembly for generating software delays in micro- and miliseconds. Simple evaluation board for ATTiny2313 microcontroller with 8 LEDs, ISP connector and all I/O pins connectors. Simple evaluation board for ATmega162 microcontroller with 32KB external RAM, ISP connector and all I/O pins and memory bus connectors.